The history and evolution of Government and Country of Costa Rica are symbolized profoundly in the Costa Rica Flag and Shield. Not many have considered these meanings, and sometimes they become forgotten through our busy lives. No doubt it is important to take some time to find out such things. To know better how and why Costa Rica and its people ended up the way they are today. The History of the Costa Rica Flag spans back to 1848, some 169 years ago. Costa Rica had just separated from Spain a few years before and joined the United Provinces of Central America. During that time they used the flag of United Provinces of Central America. It looked much different than what it is now, having light blue stripes top and bottom and a yellow stripe in the middle. Within the short period of 1821-1848, the flag changed seven times. The Blue, White and Red design we see today came from Wife of President José María Castro Madriz; and was inspired by the French revolution. 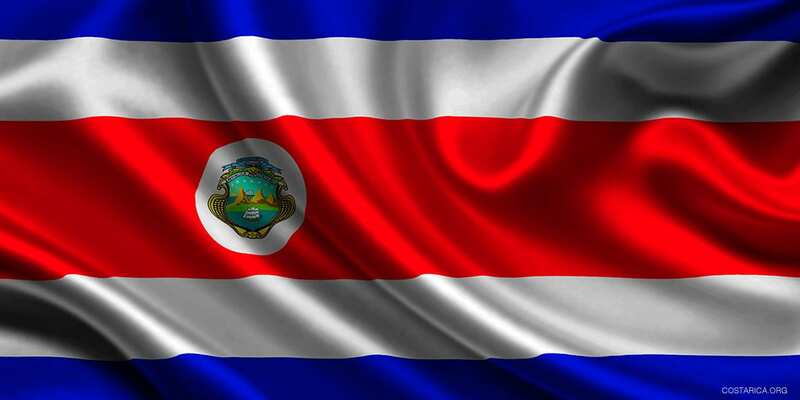 The colors of the Costa Rica Flag have significant meaning in how the country is governed and came to be today. For this reason, the dark blue represents the sky, idealism, opportunities and perseverance. The white stripes represent peace, wisdom, and happiness. The red stands for the blood spilled by martyrs defending the country, as well as the warmth and generosity of the Costa Ricans. In English, there is only one word for a flag, but in Spanish, there are two words, “Bandera Nacional” and “Pabellon Nacional.” Bandera Nacional meaning the simple flag with stripes. Lastly, Pabellon Nacional meaning including the flag and shield. The current shield had a very similar history and evolution as the flag. It changed five separate times before the 1848 design. At the time the Coat of Arms started out as a triangle having five volcanoes within and then transitioned to the United Provinces of Central America Emblem. This emblem had the right arm and bare chest of a man, surrounded by green mountains in a circle. Next, the final design before 1848, a white 8 pointed star with a yellow circle and legend of Costa Rica. Finally, the 1848 model has three volcanoes, two ships, and five stars we can see featured on the stamp of 1863. Today the shield is very similar to the 1948 edition. Since then, they revised to include two more stars and now smoking volcanoes. First, we see on the emblem, the three smoking blue/green volcanoes representing the three most significant volcanic ranges of Costa Rica, Irazu, Poas, and Arenal. Second, the green area below the volcanoes represents the valley between the mountain ranges. Third, the Ocean on either side of the volcanic ranges accounts for the Atlantic and Pacific oceans, and the ships symbolize ports on either side of Costa Rica. The seven stars, represent seven provinces, San Jose, Cartago, Guanacaste, Alajuela, Heredia, Limon, and Puntarenas supporting the country. All in all the flag and shield of Costa Rica hold significant meaning. Indeed because of the beautiful landscapes and personalities we see here in the Country of Pura Vida. The Costa Rican National Anthem is called Noble patria, tu hermosa bandera (Noble homeland, your beautiful flag) and praises the flag. The song was composed in 1853 by Manuel María Gutiérrez and José María Zeledón Brenes’ lyrics were added in 1900.